How can you do this to another man's wife? Sigh! 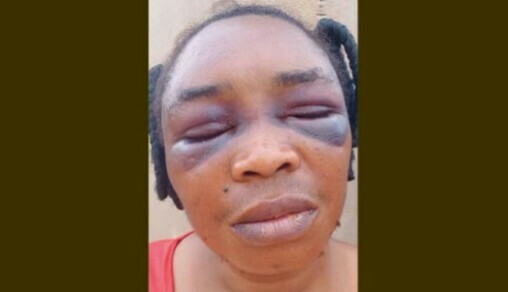 Some men suspected to be Indian hemp dealers at Ogbese in the Akure North Local Government Area of Ondo State have allegedly beaten up a woman, identified as Mrs Martina Christopher, her father and brother to a pulp over the disappearance of bags of cannabis kept on the victims’ farmland. It was gathered that the Indian hemp dealers, numbering about 40, had last Thursday invaded Martina’s farmland, located at Bolorunduro village in the council area, to search for some bags of the cannabis earlier kept on the farm. They were said to have met Martina’s brother, Isaac Akpan, working in the farm. As the dealers could not find the bags of cannabis, it was gathered that they accused Isaac of stealing the product and thereafter tortured him before taking him away, The Punch reports. Having received the news of the incident, Martina and her father, Mr Joseph Akpan, were said to have traced the hoodlums to Ilu-Abo community in order to rescue Isaac, but they too were beaten up by the alleged hemp dealers. Narrating her ordeal, Martina said, “I went to the farm very late on the fateful day to join my husband and brother on the farm, because we had left the farm unattended to for some days. “I met these people, about 40 of them on 15 motorcycles, then I saw my brother, who had been beaten and injured, sandwiched between some of the hoodlums on one of the motorcycles; I had to turn back and later, I was told that he had been taken to Ilu-Abo. “I then went to Ilu-Abo in company with our father, only to see my brother mercilessly beaten and injured; and immediately the hoodlums saw us, they descended on us and beat me and my father to a pulp, demanding to know the whereabouts of the bags of Indian hemp kept on our farm. She explained that the hoodlums threatened to wipe out the entire family if they failed to produce the missing bags of Indian hemp, adding that the hoodlums bragged that no security operatives could arrest them. The husband of the victim, Mr Augustine Christopher, said he had to report the case at the Area Command in Oba Ile, Akure, following the threat to wipe out his family. He appealed to the state government and the security agents to save his family from the hoodlums. When contacted, the Police PRO in the state, Mr Femi Joseph, confirmed the incident to The Punch and said the command had made some arrests over the matter. “The Commissioner of Police, Mr Gbenga Adeyanju, has ordered that the matter should be transferred to the State Criminal Investigation Department in Akure, while investigation is ongoing,” Joseph added.